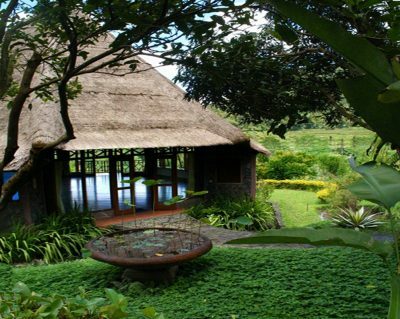 Located in the east side of Bali, this meditation center inspires you to connect with the spirituality and the magic of the island within an incredible environment. The property is located adjacent to the river in a beautiful valley. Extensive rice fields and hills create a picturesque environment of lush vegetation. You can see and feel the overwhelming presence of the sacred mountain, Gunung Agung. The views from every corner on this property will recharge your soul. The silent atmosphere supports one to discover a conscious, clear and joyful way of being with oneself. This retreat venue has 6 separate cottages that provide 12 rooms, all with their own en-suite bathrooms. The cottages are located at various levels of the property. 6 of these bedrooms provide a matrimonial bed plus a single bed, offering the possibility to sleep 3 people per room. 4 rooms have twin beds and 2 rooms provide matrimonial beds. From the top of the gardens down to the edge of the river, all the bungalows offer stunning views. Because of the cool breeze from the river air conditioning in the rooms is not necessary, since the rooms maintains comfortable temperatures throughout most of the day, especially at night. In addition to the veranda of each bungalow, there are also some “bales” (typical Balinese outdoor bed) and pavilions spread over almost one hectare of gardens filled with flowers. From the restaurant, small paths lead you through the abundant gardens throughout the other areas of the property. One may swim in or cross over the river which leads to a vast area for trekking through the rice fields. An octagonal room with a wooden floor is ideal for yoga, meditation, seminars and group activities. A yoga class can accommodate more than twenty people. Views from this room over look the valley and river. Every day at dawn and dusk there is a meditation session where all the guests and locals are welcome. The facilities also include a small spa room offering traditional Balinese treatments and reflexology sessions. Every corner of this place conveys the sensitivity and love that their designers have put into every detail. Here you can experience the essence of Balinese life. Many of the daily activities taking place at the center are focused on spiritual growth and in maintaining balance and harmony within nature. Rice, chili, peanuts and other traditional crops are grown on the grounds that surround the property. The area is largely rural, made up of small towns that are far away from the crowded touristic spots. The sights, sounds and smells of the natural environment help tune you in with the pace and habits of daily Balinese life. We recommends that during your stay, you participate in trekking activities available within the surrounding areas to enjoy the natural environment. If you wish to Host your Retreat in Bali at this venue, rates start at $65 USD per person / per day in double occupancy during low season.